With PerfectServe®, our open architecture includes an integration engine that is source system agnostic. Information exchange occurs with third-party applications via HL7 or PerfectServe’s RESTful API. As part of our implementation methodology, PerfectServe will work with your technical and clinical project team members to determine the required workflows and integration requirements. Nuance provides intelligent systems that support a more natural and insightful approach to clinical documentation, freeing clinicians to spend more time caring for patients. 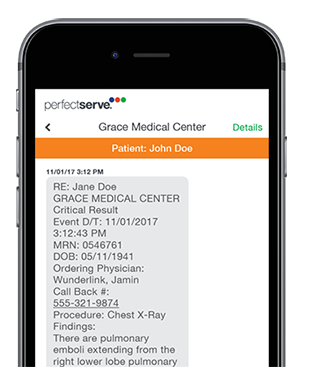 As the industry-leading solution for critical test results and actionable findings management, PowerScribe® 360 Critical Results automates delivery, verification of receipt, and documentation of critical test result communications. PeraHealth is transforming healthcare through the intelligent use of data. PeraHealth solutions, powered by the Rothman Index, provide a visual representation of the patient’s condition and progress in real time. Leading hospitals and health systems utilize PeraHealth predictive analytics to improve quality and reduce cost.